A handful of nuts a day may be enough to reduce the risk for death from heart disease and other ills. In a review combining data from 20 prospective studies, researchers found that compared with people who ate the least nuts, those who ate the most reduced the risk for coronary heart disease by 29 percent, for cardiovascular disease by 21 percent and for cancer by 15 percent. There was also a 52 percent reduced risk for respiratory disease, 39 percent for diabetes and 75 percent reduced risk for infectious disease in those who ate the most nuts. 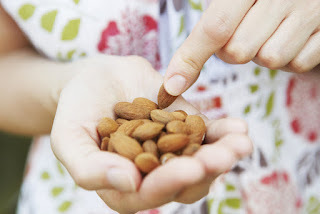 Most of the risk reduction was achieved by eating an average of about one ounce of nuts a day, the amount in about two dozen almonds or 15 pecan halves. There was little decrease in risk with greater consumption. The study is in BMC Medicine. "It has been shown in randomized trials that higher nut intake can reduce triglycerides and cholesterol in the blood," said the lead author, Dagfinn Aune, a research fellow at Imperial College London. "And nuts are high in fiber, antioxidants and polyunsaturated fats." Unless a person is allergic to them, Dr. Aune continued, eating nuts has little risk and considerable potential benefits. "It's not large amounts that are needed," he said, "so it's a small dietary change that should be feasible for most people."